I often purchase spare of the moment ingredients I see, temptation too overpowering. I usually have no idea on how I will use said ingredient, but I am overwhelmed with the need to have them. This doesn’t present such a problem when they are pantry items. I have a list of pantry items waiting for me to play around in the kitchen with them. The problem is when it is fresh produce, like unusual fruit or vegetables, or simply in season, which grab my attention. This is what happened with these pears. I spent the Saturday out shopping and have a lovely lunch with Amanda. On venturing into the local Asian grocery store, I spied these mini pears. I apologise now that I have no idea what variety they are, just small, cute as a button little pears. I just had to have them. Of course, as Amanda and I do, we often buy the same ‘special’ ingredients when out shopping together. Even when not shopping together and with no discussion between us our brains will be on the same wavelength. You will find the odd similar recipe or ingredient use on our blogs, which is rather funny as our styles are quite different. The peach popsicle recipes are a great example. Amanda also purchased the pears, please check out her stunning poached pear & mascarpone tart recipe. My pears remained untouched in the fridge for a while. The boys were told to stay away (not that they would eat them in any case, they were fruit after all), and life was busy. It then came to my realization that I was heading out of Sydney for a few days. I was pretty sure the pears wouldn’t last in their current form, and the idea of cooking them for use later came to mind. I thought back to my whole candied orange recipe, and decided to use a cooking method somewhere between candying and normal poaching. I wanted the pears to have more of a candied result, but I didn’t have the time to truly candy them. I went for a heavy handed sugar poaching approach. Which also resulted in a beautiful tasting and smelling syrup. You will end up with far more syrup than you need for the cup cakes. I have found that the syrup works as a wonderful replacement for maple syrup on pancakes, drizzled over fruit etc. You will note in the ingredient list the addition of rhubarb syrup. This was one of those pantry items lined up ready to be played with. I am not sure the use adds too much to the end result of the syrup. If you don’t have this in your cupboard, don’t run out and buy a bottle just for this recipe, add some vanilla extract instead. The cup cakes are dense and moist. Would be prefect served with some thick cream on the side and an extra drizzle of pear sugar syrup. 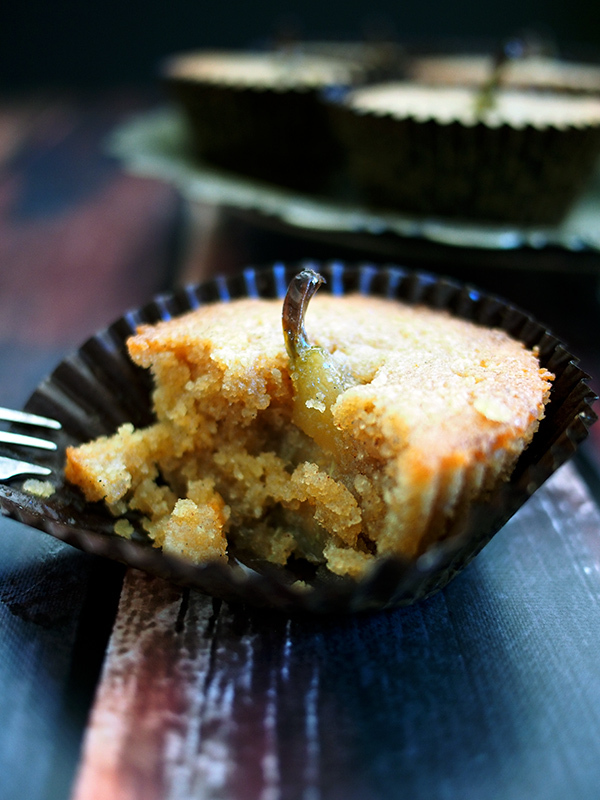 Delicious moist cup cakes with a whole mini pear. Recipe is gluten free too. Pre-heat oven at 170 deg C (340 deg F). Prepare a large size cup cake tray (or muffin tray) with 10 paper cup cake cases. Using an electric mixer beat butter and sugars until well creamed. Add eggs one at a time, beating well between additions, to combine. Mix through almond meal, rice flour, cinnamon and nutmeg. Half fill the cup cake papers with batter. Then place a pear in each, slightly pushing down. Top up with some more batter, until cup cake papers are filled three quarters of the way. Bake in the over for 30 minutes or until golden brown and cooked through. Remove cup cakes from oven when cooked, and place on cooling rack. 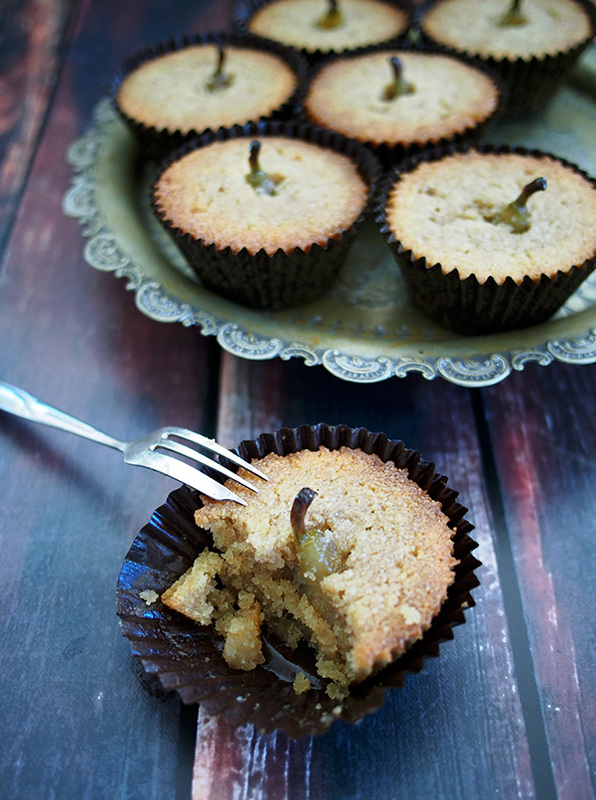 Spoon some of the pear sugar syrup over the cup cakes while they are cooling. Store cup cakes in an air tight container; they will keep for a couple of days. 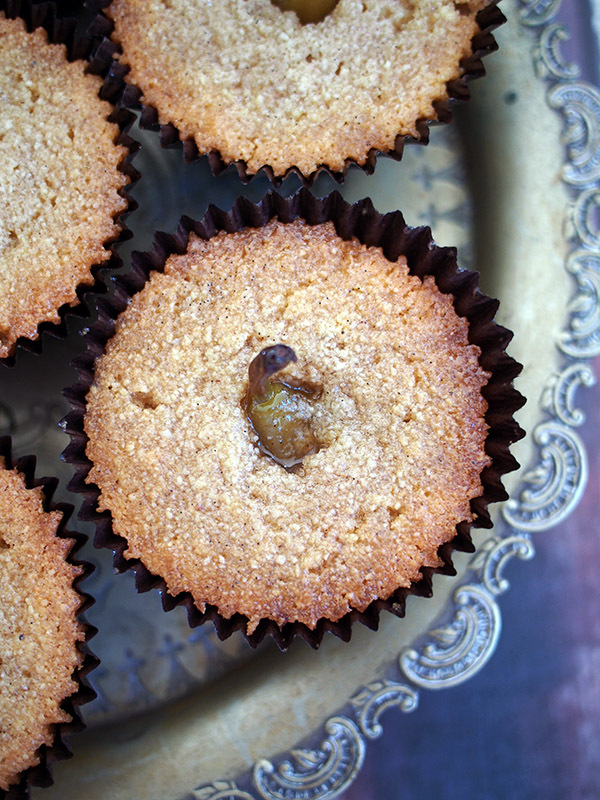 Pear Sugar Syrup: While your cup cakes are cooking, prepare your pear sugar syrup. Placed your reserved liquid from making your sugar pears in a medium size pot. Bring to the boil and cook for 10 minutes. They syrup will thicken and flavours intensify. A cross between poaching and candying, which leaves you with a delicious pear cinnamon syrup. Place all ingredients, except pears in a large heavy base pot. Over low heat stir until sugar has dissolved. Add pears to the sugar mixture and slowly bring to fast simmer. Simmer pears for 30 minutes. Remove from heat and leave in pot to cool. 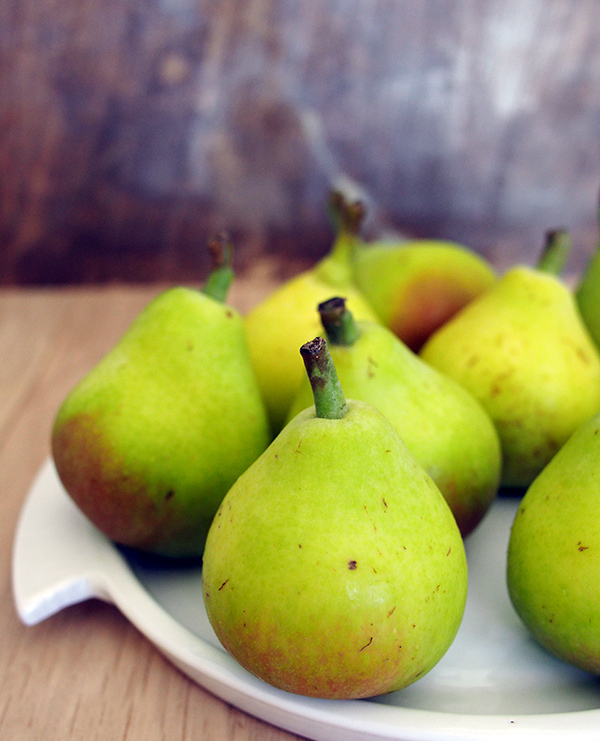 Once cool remove pears from liquid and store in an air tight container, store in the fridge. Reserve cooled liquid in a clean jar in the fridge. Really clever! What a great idea. Those baby pears are very popular in our house. Love your style, Sara. I love coming across something and buying it for the sake of seeing what I’ll end up making. Other than on a tree, I don’t think I’ve ever seen pears that small for sale. that looks extremely delicious! now where’s my cup of tea?